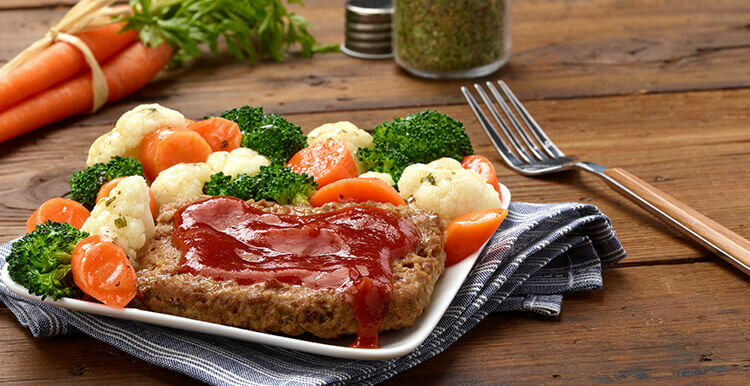 Few foods are more comforting than the classic meatloaf. Crafted with savory seasoned beef then topped with a rich tomato sauce and paired with a blend of carrots, broccoli and cauliflower florets for a hearty dish that's sure to satisfy. CONTAINS: ANCHOVIES, MILK, SOY, WHEAT. Ingredients: WATER, COOKED BEEF, CARROTS, BROCCOLI, CAULIFLOWER, TOMATO PASTE, TEXTURED VEGETABLE PROTEIN (SOY PROTEIN CONCENTRATE, CARAMEL COLOR), SUGAR, WHITE VINEGAR (DISTILLED VINEGAR, WATER), BREADCRUMBS (ENRICHED WHEAT FLOUR [NIACIN, FERROUS SULFATE, THIAMINE MONONITRATE, RIBOFLAVIN, FOLIC ACID], YEAST, SOYBEAN OIL, SALT, CORN SYRUP), MODIFIED FOOD STARCH, CANOLA OIL, ONION, SEA SALT (SODIUM CHLORIDE, POTASSIUM CHLORIDE), GREEN BELL PEPPER, SPICES (WITH MUSTARD), GARLIC (GARLIC, WATER), NONFAT MILK, BEEF FLAVOR BASE (BEEF, FLAVORS, SALT), BEEF STOCK, ONION POWDER, WORCESTERSHIRE SAUCE (DISTILLED WHITE VINEGAR, MOLASSES, SUGAR, WATER, SALT, ONIONS, ANCHOVIES, GARLIC, CLOVES, TAMARIND EXTRACT, NATURAL FLAVOR, CHILI PEPPER EXTRACT), SOY SAUCE (WATER, WHEAT, SOYBEANS, SALT, ALCOHOL, VINEGAR, LACTIC ACID), GARLIC POWDER, DRIED GARLIC. Nutrients: WATER, COOKED BEEF, CARROTS, BROCCOLI, CAULIFLOWER, TOMATO PASTE, TEXTURED VEGETABLE PROTEIN (SOY PROTEIN CONCENTRATE, CARAMEL COLOR), SUGAR, WHITE VINEGAR (DISTILLED VINEGAR, WATER), BREADCRUMBS (ENRICHED WHEAT FLOUR [NIACIN, FERROUS SULFATE, THIAMINE MONONITRATE, RIBOFLAVIN, FOLIC ACID], YEAST, SOYBEAN OIL, SALT, CORN SYRUP), MODIFIED FOOD STARCH, CANOLA OIL, ONION, SEA SALT (SODIUM CHLORIDE, POTASSIUM CHLORIDE), GREEN BELL PEPPER, SPICES (WITH MUSTARD), GARLIC (GARLIC, WATER), NONFAT MILK, BEEF FLAVOR BASE (BEEF, FLAVORS, SALT), BEEF STOCK, ONION POWDER, WORCESTERSHIRE SAUCE (DISTILLED WHITE VINEGAR, MOLASSES, SUGAR, WATER, SALT, ONIONS, ANCHOVIES, GARLIC, CLOVES, TAMARIND EXTRACT, NATURAL FLAVOR, CHILI PEPPER EXTRACT), SOY SAUCE (WATER, WHEAT, SOYBEANS, SALT, ALCOHOL, VINEGAR, LACTIC ACID), GARLIC POWDER, DRIED GARLIC.